use new data sources for scientific research. Survey teams use the Dusttrak 8530 to measure the PM levels in the air along specific paths close to homes and schools. The location of the survey team is tracked and recorded by the AMOD Global Positioning System unit. 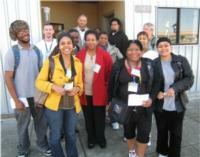 Participants can join other community organizing, advocacy and story telling activities. Yes. Information about air quality and the health effects of pollution. You will also learn how to use professional air monitoring equipment and GPS devices. The PM levels and the location information are shown on a google-style map on the world-wide-web. Ultimately, results of this study may help support near-road PM regulatory programs and determine methods to distribute “citizen science” data. This project partners with Common Sense, participatory sensing project, to develop easily deployed air quality monitoring devices. "Unlike high stationary sensors, Portable PM loggers record what residents breathe at ground level, near places (residential areas, schools, and parks) frequently traveled by the elderly and children." Future work: We are seeking funding to bring our air quality data gathering process indoors. We want to engage our local schools in assessing air pollution inside school buildings and using that information to help reduce asthma triggers in the classroom. Our goal is to empower parents through the schools to address indoor air quality in the home by helping families understand the structural and behavioral factors that affect indoor air quality.